We design many engagement rings for guys who want to surprise their girlfriends. This seems to be the most popular way to propose, although an increasing number of couples come in to design their rings together as well. Custom designing such a significant item for your partner is beautiful. But it’s not always easy. Sometimes, guys think they have done their research and know what their partner wants, but after asking her more details, they realize that she might actually want something totally different. So, although asking her might seem like a good idea – it often adds to the confusion. Would she like an unusual Diamond shape? 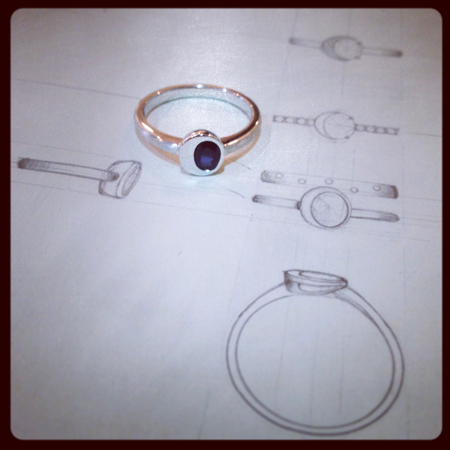 Often it is better to just design a ring that you think is nice and would suit her. Or maybe even come up with a design that you feel symbolizes what you want to say. It is better than guessing or trying to make a ring that matches one of her passing comments. “I love Aquamarine” does not mean she would say No to a diamond. “So-and-so proposed with a huge Diamond” does not mean that is what she wants. Would a colour gemstone suit her personality better? She might like chunky designs to go with her outfits, but still appreciate a delicate solitaire as The Ring. Perhaps she would love the solid feel of the clean and modern engagement ring that you designed for her. Sometimes guys try to please their girlfriends so much that they lose confidence in their own taste, and in turn, the design suffers. The point of you designing a ring without her knowing, is for you to share something with her. In a way, the ring should represent you as much as it does her. Now, try again! Yes! Finally someone writes about unique wedding rings.